On one fine morning, Mr.X who worked with an organization for more than 5 years receives a call from a Junior HR Executive mentioning that Your services are no longer required, hence you need to Resign by evening, otherwise we terminate you. With a termination, your Profile will have a bad mark. You have no choice than to resign respectfully and we process the exit formalities. Just imagine a person who was not on performance Improvement nor he was not a non-billable resource. The whole of the conversation would go on that these are instructions from Heads and management and there is no point in approaching higher ups as well. That may not be the best way to handle such situation. What can be done? On review of the situation, you would notice that there is no plan for communication of redundancies, No plan for execution of layoff. In the non-unionized environment, it is important to have the right steps to ensure that transition is managed without damaging the BRAND Value of the organization. l That Business impact is lower. l The Brand value & reputation of the Organization is intact. l The ability to invite people to join back when the business bounce back. 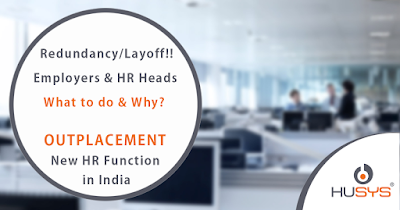 l Use the HR Function effectively in the transition process. l Understand the Process of Outplacement a concept which is a critical role for HR in many countries. l If there could be a possibility of a shift to similar business units where the skills are utilized. l Plan to have a less impact on the business with a specific budget to include an Outplacement support and management acceptance. l Help people to accept the change with less resistance. l Identify a right expert agency to support or hire a right Consulting Partner. l Help train the Managers to handle the change. l Help build programs to ensure that the impacted employees are provided with an option to transition smoothly. What can Business & HR do? l Take the business decision with all the Managers and help them to understand the reason and seek support. l Train the Managers to handle the situation and help transition smoothly. l HR to conduct the meeting with Individual / Group orientation on the situation and what is forcing them for change. l Allocate a budget for Outplacement support in the severance package - mandatory or optional to Impacted Individuals (In India the awareness of Outplacement is not there for teams. Need to educate on how it can help manage the emotional impact of confidence building and winning better job/startup/retirement can be achieved based on career stage.). Husys & Career Star Group(CSG) join hands to bring the best of Outplacement experience across the globe and customized services for India. We collaborate with more than 70 countries HR companies and their know-how in Outplacement and set in the Indian context. Husys delivered more than 1500 candidates support in outplacement for many International and Domestic companies in India. Our team of experts understands the delivery from the Indian Continent perspective of Social Fabric, Job Market & strategy and Career complexities. Join our webinar on 30th August 2017 at 4 pm India Time. #outplacement #indiaoutplacement here is where you can learn more from the expert in India. 30th August 2017 at 4 pm.